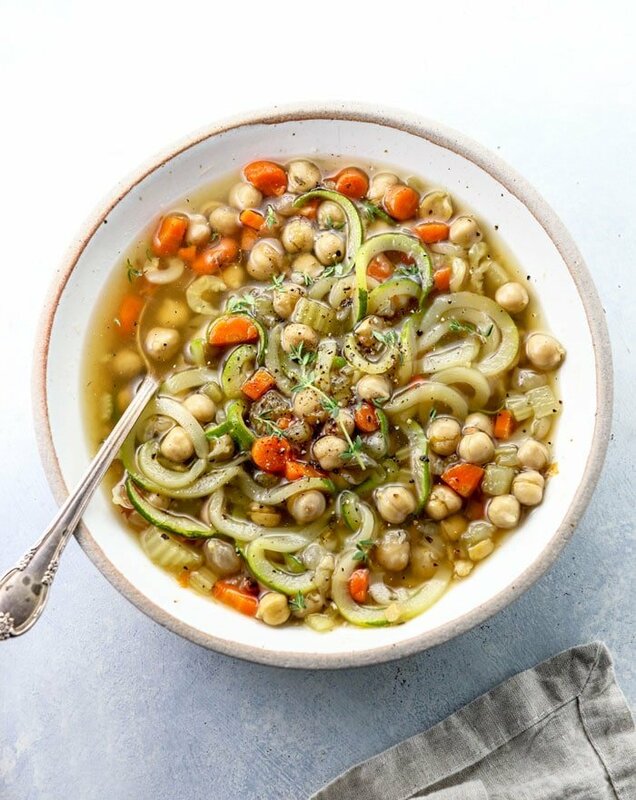 This Vegetarian “Chicken” Noodle Soup is made with protein-rich chickpeas instead of meat, for a plant-based alternative. 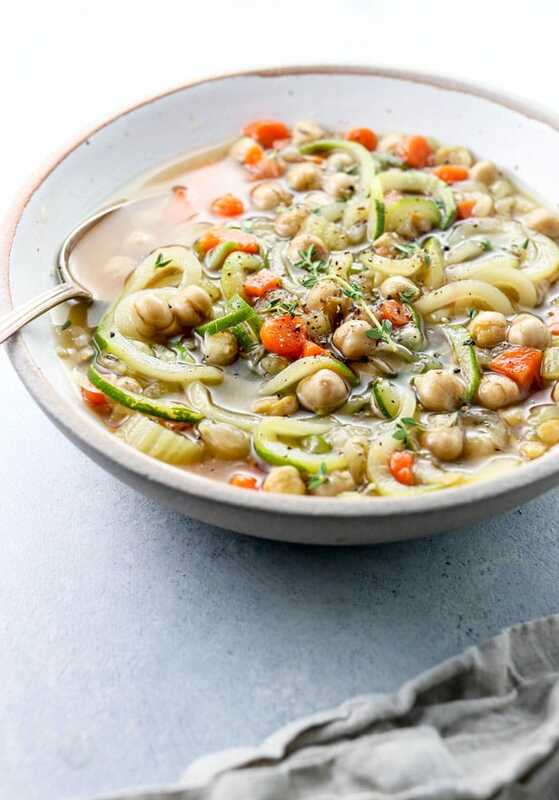 You can use real noodles in this soup if you’d like to, but for even more of a nutrient boost I like to use zucchini “noodles” for an extra serving of veggies in each bite. This recipe is adapted from my popular Chicken & Vegetable Soup, which I’ve been making for years with water instead of vegetable broth. I think using store-bought or homemade stock is unnecessary when making soup, because you’re going to let vegetables and seasonings simmer in water with plenty of seasoning. Isn’t that how you make stock, anyway? As long as you’re not timid about using a mineral rich salt, like pink Himalayan salt, your soup will have plenty of flavor without using broth. However, if you prefer to use vegetable broth or homemade stock, go for it! You might just want to use slightly less salt, since many store-bought brands already have added sodium. You can make this healthy soup in the Instant Pot (<affiliate link to the model I own) or on the stove top. I’ve been preferring the Instant Pot lately, simply because there’s less involvement on my part. Once I’ve sauteed the veggies, I just press a button and walk away. No waiting for the water to boil, or checking on the soup during the cooking process. The total time isn’t necessarily faster when you use the Instant Pot, but your hands-on time is definitely reduced. 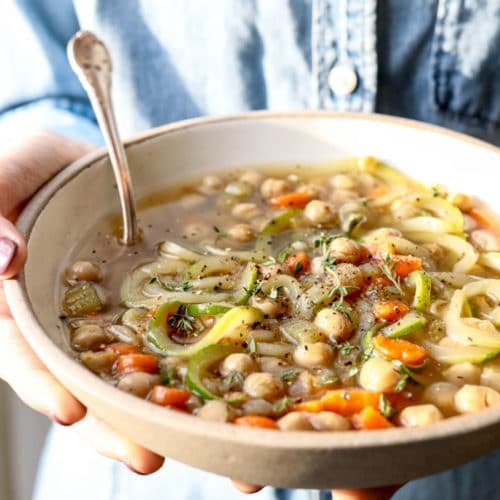 If you don’t care for the texture of chickpeas, I think this soup would also be nice with a creamier white bean, like Great Northern or Cannelini beans. I hope you’ll enjoy it! 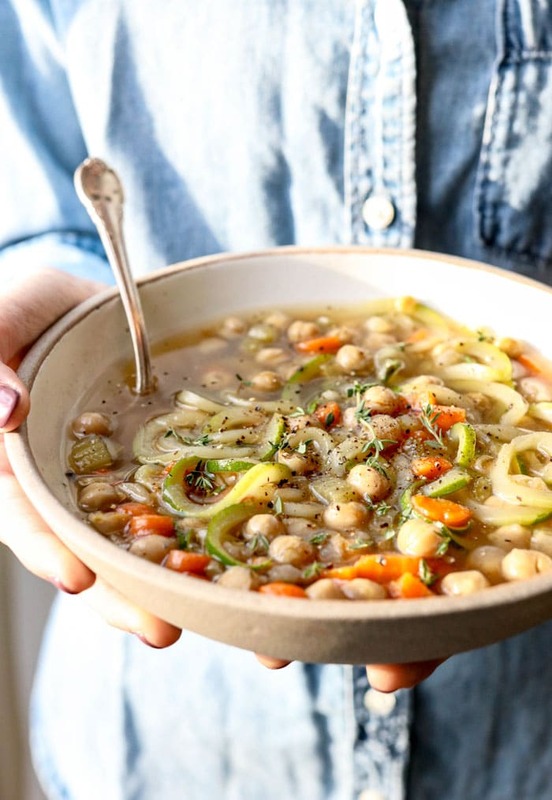 This healthy soup uses protein-rich chickpeas instead of chicken for a vegetarian soup recipe. I like to use spiralized zucchini "noodles" for a low-carb and nutrient-dense alternative! In a large stockpot, heat the olive oil over medium heat and gently saute the onion, garlic, chickpeas, and tamari for about 5 minutes, until the onion starts to soften. Add in the carrots, celery, thyme, 2 teaspoons of salt, a few grinds of black pepper, and 4 cups of water. Bring the water to a boil, then lower the heat and cover the pot with a lid. Let the soup simmer until the vegetables are tender, about 20 to 25 minutes. While the soup is simmering, use a spiralizer to create "noodles" out of the zucchini. When the soup vegetables are tender, stir the zucchini noodles into the hot soup and stir briefly, about 1-2 more minutes, until the zucchini is wilted and tender. Season with additional salt and pepper to taste, and serve warm. Leftover soup can be stored in an airtight container in the fridge for up to a week. Instant Pot: If you'd prefer to make this in the Instant Pot, use the Sauté function to complete Step 1, then press the Cancel button to change settings. Add in the ingredients in Step 2, secure the lid and turn the pressure release to sealing. Cook on high pressure for 10 minutes then allow the pressure to naturally release for 10 minutes. Move the pressure release to venting to release any remaining steam pressure, then stir in the zucchini noodles and adjust the seasoning to taste. Serve warm. Just like any soup, this recipe is very adaptable, so feel free to use any vegetables you have on hand. If you want to use fresh herbs instead of dried, I’d at least double or triple the amount you use. As always, if you try something different, please let us know what worked for you by leaving a comment below. We can all benefit from your experience! Reader Feedback: What’s your favorite kind of soup? We love this soup! It’s warm and cozy and feels so virtuous. I always seem to have some left over though. Has anyone had any luck freezing this? Loved this soup! I added Japanese Soba noodles instead of zucchini. Even my 5 year old can’t get enough of it! I made this last weekend and have been eating it all week for lunch. I really like how much flavor the beans take on from sauteeing them with the onions, garlic & tamari. That is definitely a technique that I will use when creating soups from scratch going forward. I gave some to a friend of mine who declared that it was perfect, (which makes a lot of sense since she likes her food on the bland side), but I have found myself adding a lot of salt, herbamare and even grains of paradise to turn up the flavor volume. I like a very strong broth, so when I make it again — which I definitely will — I will use vegetable stock instead of water. With that one tweak, I feel like this is going to be a nice staple in my food rotation. I made this is the crockpot so it was ready after a long day outside. First I sauted the onions and gralic then added the chickpeas and tamari (I used liquid amino acids, is it the same thing?) to the pan. Once those falvors were all married I put it in the crock pot for 5 hrs on high and added the zoodles the last hour. It’s delicious! I used water bc I didnt have any broth on hand, and just added a few whole carrots and celery to make a little more stock flavor. My only issue with cooking this way (and always is with crockpot meals) is the salt. There was no where near enough salt, but this is something that was easily fixed. Absolutely love this recipe! Thanks! I made this for dinner yesterday and everyone loved it. Since I was out of thyme I added a bay leaf and the flavor was spot on! Thanks for the awesome recipe. I made it in the Instant Pot and it was so easy. Came out great. I made a double batch and served it to my employees and the next day leftover to a friend and my son and it went over great with everyone. One gentleman preferred a little more spice and suggested curry. But everyone could doctor up his bowl as he wished. Thanks for this recipe. IT was great.